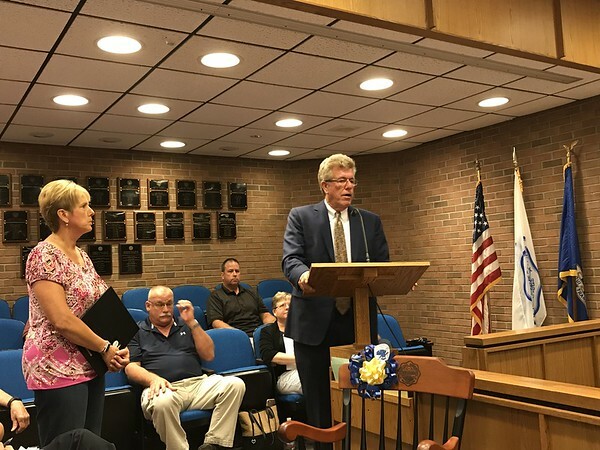 PLAINVILLE - Town Council Vice Chairman Scott Saunders and his wife, Board of Education Chairwoman Andrea Saunders, have announced that they will be stepping down and moving to Florida. They were presented a “town chair” in gratitude for their service at Monday’s Town Council meeting. Their resignations are effective July 26. Scott and Andrea Saunders served eight and a half years on their respective panels. Both were elected in 2009. Scott Saunders also served on the Inland Wetlands Committee from 2006 to 2009 and was a justice of the peace from 2008 to 2009. Lee noted that Scott Saunders had been the liaison to the fire department and went to many of its pasta fundraisers. Scott Saunders founded Wings & Wheels and volunteered at the Pumpkin Festival and Balloon Festival. Lee thanked Scott Saunders for challenging him and making him carefully consider each issue. Fire Chief Kevin Toner also thanked Scott and Andrea Saunders for their volunteer work and service to the town over the years. “All good things must come to an end,” Scott Saunders said. “Eventually you have to get out of the way and let the next generation take over. Scott Saunders said he came to Plainville as a transfer from the U.S. Air Force to the National Guard. He then met his future wife and decided to stay in town and raise their son. They have lived in town for 32 years and are now moving to Florida to be closer to their son. “I built my computer business here and friendships to last a lifetime,” said Scott Saunders. Scott Saunders said he was happy to work on state Rep. William Petit Jr.’s campaign and volunteer with local organizations. He praised his fellow councilors, Lee and other town staff, Economic Development Director Mark Devoe and the local police and fire departments. 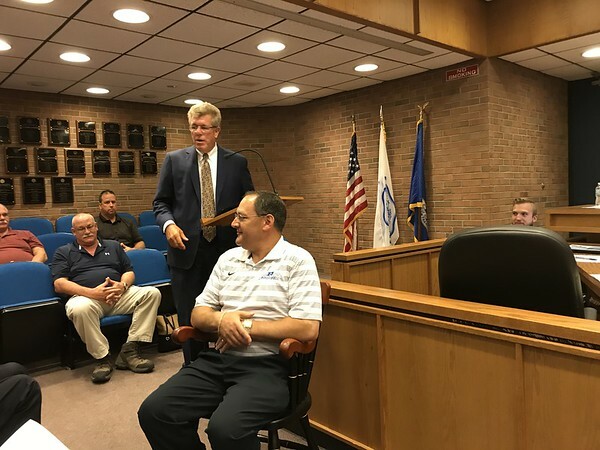 Councilor Chris Wazorko, a Democrat, said he would miss his retiring Republican colleague and said that, although they disagreed on some issues over the years, they came together to compromise and do what was right for Plainville. School Superintendent Maureen Brummett praised Andrea Saunders, who has chaired the school board for six years. She pointed out that Andrea Saunders oversaw two major construction projects at local schools, helped get Chromebooks in each classroom and said that students have seen “significant gains” on smart balance assessment tests. Andrea Saunders thanked the residents of Plainville for letting her serve. Posted in New Britain Herald, Plainville on Tuesday, 17 July 2018 19:54. Updated: Tuesday, 17 July 2018 19:56.